Michael Maggen graduated from the Bezalel Academy of Art and Design in 1982 and continued on to study conservation at the Italian Institute for Pathology of the Book in Rome, Istitutto Centrale per la Patologia del Libro. These studies lasted about two years and included practical apprenticeship at one of the main conservation laboratories in Rome where Michael Maggen specialized in the conservation of medieval illuminated manuscripts. Upon his return returned to Israel in 1985, he immediately began to work as conservator in the Israel Museum and soon began one of the most important projects of his career – the restoration of the famous manuscript “Allepo Codex” – a project he was involved in for seven years. 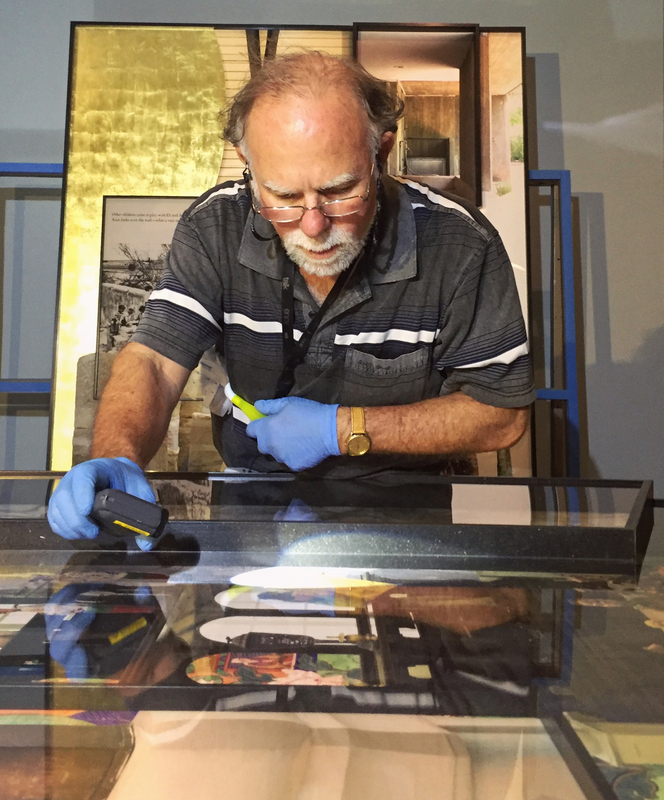 During his many years at the Israel Museum, Michael took part in the preservation of the Dead Sea Scrolls, rare medieval Jewish manuscripts, books, prints, drawings and much more. About 15 years ago he was appointed Head of the Paper and Parchment Conservation Laboratory at the museum. Michael Maggen published numerous articles on conservation and participated and lectured at international conferences, workshops and other professional venues. He also lectures to various groups at the museum and at informal external events. He views these talks as an important and valuable part of his work and an opportunity to reach out to a diverse audience that is curious and interested in the subject of conservation. Michael Maggen resides in Israel but comes to the U.S. frequently. The lecture will survey the conservation of the Dead Sea Scrolls and their history. It will focus on the conservation of a segment of the Genesis Apocryphon scroll that was carried out using the most innovative technological means including the use of advanced computerized photography and imaging techniques. The story of my conservation of the Aleppo Codex at the Israel Museum Lab. The Codex is the earliest and fullest version of the Bible dating from the 10th century. It is also the most accurate version of the Bible, and was used by Maimonides in his scholarly work. The lecture will cover the dramatic history of this unique book throughout the generations, its rescue from Aleppo, the clandestine manner in which it eventually reached Israel, and the story of its conservation which lasted 7 years. The astronaut Ilan Ramon died in the crash of the Columbia space shuttle in 2003. The pages of his personal diary were miraculously found among the debris that fell down to earth following the crash. This lecture will survey the course of events leading to the accident and the rare collaboration between the Israel Police and the Israel Museum laboratories to decipher and preserve the diary using, among other techniques, image processing techniques. This illustrated fan which is made of gold and pearls and includes enamel paintings, a music box and a clock was returned to the L. A. Mayer Museum for Islamic Art in Jerusalem along with numerous other famous clocks that had been stolen from the museum more than 20 years earlier. The fan was dismantled by the thief who hoped to sell its various parts and was found in pieces. The lecture will survey the unique process of restoration that I undertook to reassemble this very unique fan, which is one of only three of its kind in the world. Monks living in a monastery in South Tyrol on the border of Italy and Switzerland in the 19th century raised a special type of spiders that weave especially dense cobwebs which are actually a kind of silk. The artistically inclined monks painted religious allegories with great skill on folios made of these cobwebs. This type of art gained momentum and recognition in the 19th century. The largest collection of this unique form of art is now at the Austrian National Museum and is part of its royal collection. Two paintings reached Israel as part of a private collection after having survived hardships and difficult conditions during the Second World War and the Holocaust. They required serious conservation and restoration that involved a great deal of special attention due to the sensitivity of the paintings. The lecture will survey the conservation process undertaken to preserve these unique works of art.